PCL closed today due to weather. French class postponed one more week. The class will run 4 weeks starting next week. Email to follow. 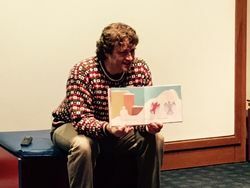 Sing and Stomp is a fun program for preschoolers where we will experience stories through music, movement, and of course, books! Come ready to sing and play. Drop-In for a creative, fun time at our Maker Table.